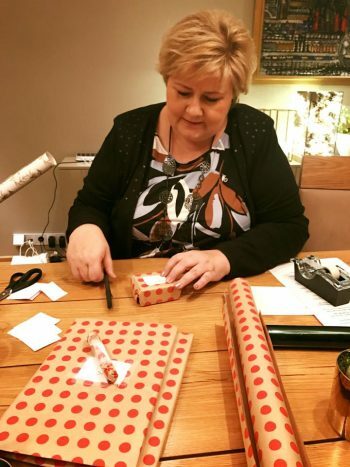 Prime Minister Erna Solberg could finally wrap a few holiday gifts this weekend after winning a green-light, quite literally, for her minority government’s highly contested state budget proposal for next year. All four party leaders involved announced their budget breakthrough Saturday evening, based on nearly NOK 3 billion worth of extra climate measures. Solberg thanked all those “who have worked day and night” to secure the budget agreement that avoided a government crisis as well as the budget crisis that’s raged for weeks. It all reached a climax last week after the small but powerful Liberals and Christian Democrats broke off budget negotiations with Solberg’s Conservatives and their coalition partner, the conservative Progress Party. That left Solberg struggling to keep her government from falling. With no backing from her coalition’s two support parties, she wouldn’t have a majority to get her budget through Parliament when debate on it begins on Monday. On Saturday, though, all four party leaders came to terms, with each of them able to claim victory on various aspects of the state budget. The Liberals and Christian Democrats arguably won the most, both in terms of climate-friendly measures aimed at cutting carbon emissions and other pet projects important for their voters. While the Liberals could boast that the new budget compromise will cut more than three-times as many carbon emissions as the initial budget proposal (662,500 tons instead of 200,000), the Christian Democrats also won a boost in kontantstøtte, the monthly funds paid out to parents who stay home to take care of their children instead of placing them in Norway’s highly subsidized day care centers. Retirees with the lowest pension income in Norway will also get a raise. Jensen, meanwhile, could boast that her party did not have to back down on its “non-negotiable bilpakken,” a package of adjustments in vehicle-related taxes that only involve minor increases in fuel taxes. The fuel taxes had been the biggest bone of contention in budget negotiations from the beginning. In an apparently creative move, however, fuel prices at the pump are expected to rise. They will be subject to the 15-øre increase per liter on unleaded gasoline that Jensen’s otherwise anti-tax-hike party had itself proposed in a conciliatory gesture at the outset. Newspaper Aftenposten reported they also will rise because of agreement that the gasoline must be blended with 20 percent of biofuel by 2020. Since biodiesel is more expensive than ordinary diesel, consumers will see a rise in pump prices. Jensen’s Progress Party, which has long billed itself as advocating car-drivers’ interests, also could be pleased with funding to reduce road tolls outside Norway’s cities and towns, where public transportation options are limited. Jensen had also successfully opposed the Liberals’ demand for higher fuel taxes on the grounds they would hurt people living in outlying areas who still must rely on their cars instead of taking a bus or train. Liberals leader Trine Skei Grande claimed that the state budget proposal now contains a major “green shift” that will not only cut carbon emissions but also create more jobs in climate-friendly sectors. Even the leader of the Greens party itself, Rasmus Hansson, was impressed by the climate improvements in the new budget proposal. “I say ‘hats off’ for the Liberals and Christian Democrats who ran the race and have moved around lots of money in the state budget,” Hansson told Aftenposten. In other important changes resulting from Saturday’s budget breakthrough, another NOK 1.5 billion was shifted from immigration and asylum programs (which are expected to cost less in 2017) to other areas like education, employment and other efforts to restructure Norway’s economy away from oil. Several government agencies were hit with more cuts in their operating budgets, including the directorates for fishing, and health, and the state will demand more dividends to be paid out from state-controlled companies like airports operator Avinor and transport firm Mesta. Asked whether the lengthy budget conflict showed that Solberg’s government “cooperation project” was fundamentally flawed, she claimed it wasn’t. “It shows that there are grand ambitions among all of these parties. There are some areas where we have problems gaining a consensus on all the ambitions. Climate is one of them.” One thing was clear after the weekend settlement: Erna Solberg will still be the prime minister who will deliver Norway’s next traditional New Year’s Day address.